Atlantic – 5 Course Crustacean Celebration | 15,000kms of Food! My first visit to Atlantic was so great, I had to go back again ASAP! 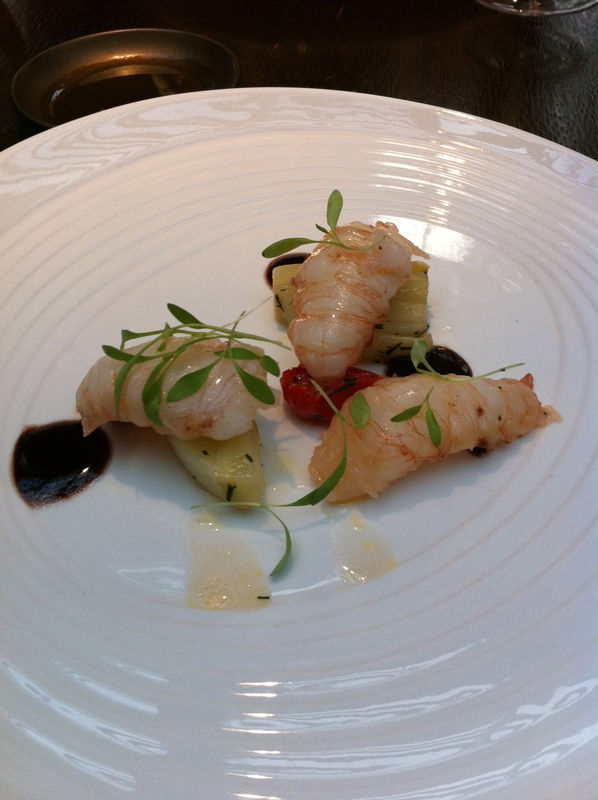 I discovered that there was a 5 course “Crustacean Celebration” on at the end of Jan, and booked it in! Service was friendly and efficient, setting was gorgeous and atmosphere for a Monday night was bustling. 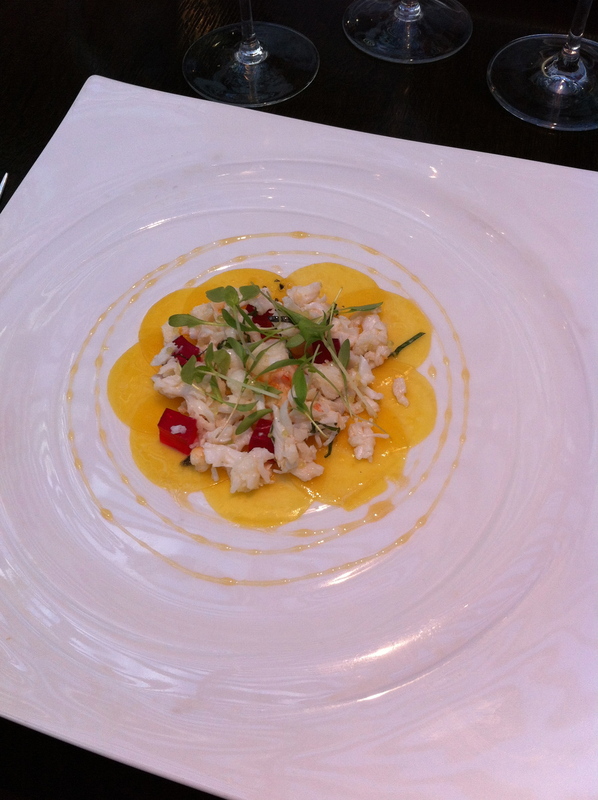 First course was “Golden Beetroot Carpaccio – spanner crab, basil, lemon, beetroot jelly“. The crab and beetroot were both sweet, which was offset and balanced by the burst of lemon. It was a great start to the 5 courses. 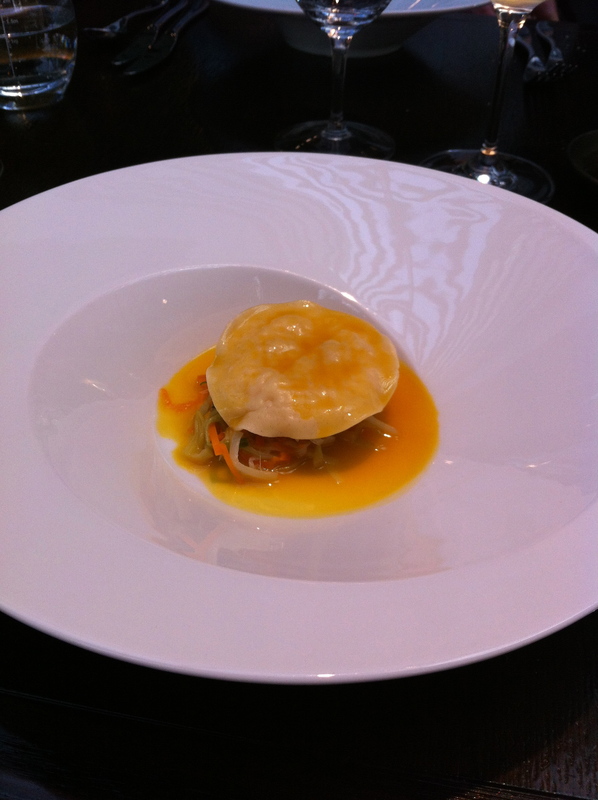 The “Raviolo of Scallops and Coriander – sauce jacquline” had a wonderfully round and firm ravioli, surrounded by a buttery sauce with veges hidden underneath adding a crunchy texture. The sauce was the outstanding element that brought the dish together. The “Slow Cooked Morton Bay Bug Tails – confit fennel, cherry tomatoes, black olive oil, tarragon” good, but unfortunately not my thing as the bugs were slow cooked and therefore very soft in texture. Looked amazing though! 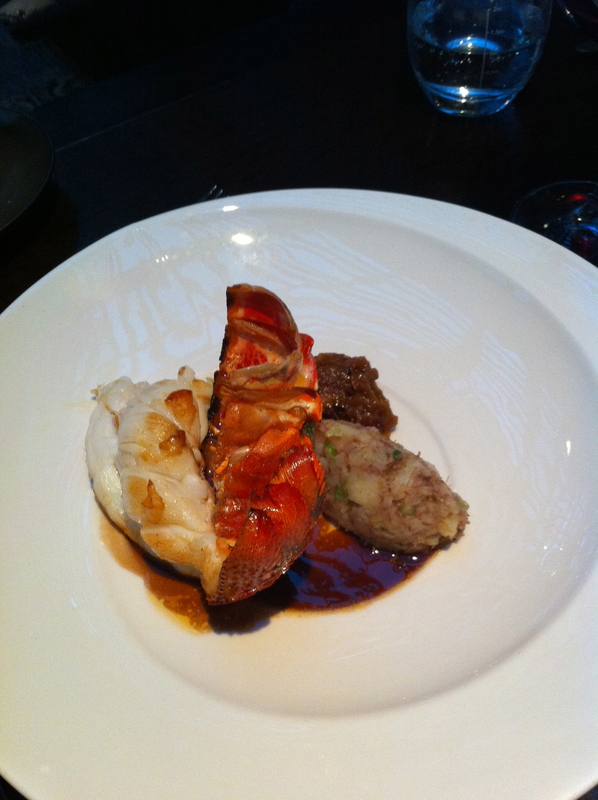 The next dish, consisted of the most exquisite and perfect lobster I’d had in awhile… “Roasted Tasmanian Crayfish – wagyu beef cheek, kipfler potato, brown onion marmalade, red wine bordelaise“. The lobster was fresh and had that wonderful taste and consistency. The sauce, onion marmalade and potato mixed through mashed potato were perfect companions. Wow and wow. 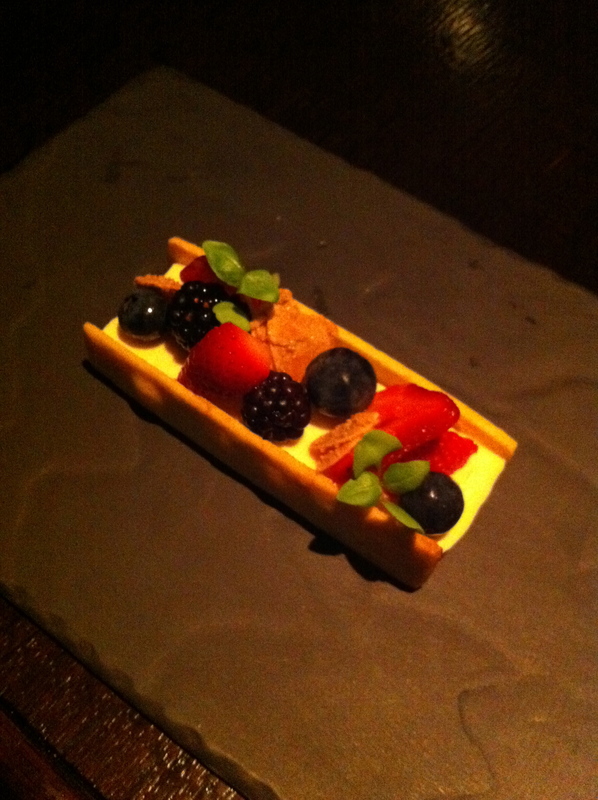 Dessert was “Honey and Goat’s Cheese Parfait – citrus sable, summer berry salad” which was a nice light way to end the 5 courses. Pretty as a picture, and tasted lovely. Overall, Atlantic has stolen my heart. I’m thoroughly in love with this restaurant. Sure some may hate on it as it’s a bit pretentious and expensive, but the food is outstanding in freshness and quality, and the cooking is executed well. Previous PostMomofuku Ssam – Whole Rotisserie DuckNext PostMerchant… Thanks Guy for the excellent pasta! Pingback: The Atlantic… great seafood cocktail! « 15,000kms of Food!